I bought the plans for my Sonex in March of 2000, and the pallet of sheet aluminum in April 2000. Since then I have been converting the paper airplane in a box into my aluminum obsession. 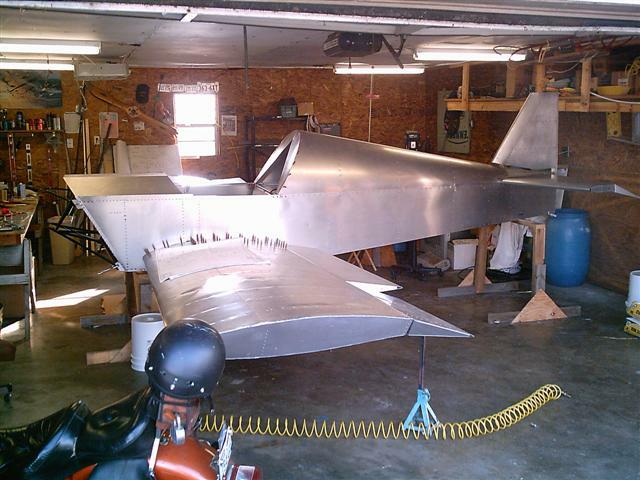 The sheet metal has been folded, spindled, and mutilated into a reasonable facsimile of an airframe. The only store bought parts so far has been the spar caps, control surface skins, plexi, and fuel tank. I am current (ly) working on the electrical system. I have gathered most of the material to start on the upholstery. The main items left to do are the instruments, avionics, and firewall forward, as well as a myriad amount of details, loose ends , and dreaming to go. I have found that a scratch built project of this magnitude to be a rewarding exercise in skill building and patience. I would like to thank all of my fellow EAAers for their advice and encouragement to keep it going.